The Dow Jones rallied 1.4% or 151 points, recouping 23 November’s 1.3% loss, following better-than-expected economic numbers in weekly jobless claims (the fewest since 2008), Oct consumer spending and personal incomes as well as November consumer sentiment index. The positive news helped to offset negative economic data such as a drop in new home sales, a dour durable goods order report and ongoing worries about the Eurozone and Korean tensions. Wall Street will be closed Thursday and will close at 1 pm on Friday. On Wall Street, recent economic data coming out from the US has been on a positive bias, easing investors’ concerns of a double-dip. Having said, the Fed is not taking any chances, and is embarking on QE2 to further support of US economy. At the same time, China’s recent economic data also suggests stabilization, with tightening by its central bank reflecting its confidence in its economy. All these have bolstered investor sentiment, reflected by the Dow Jones’s ability to close above 11k in the last few sessions despite facing wild swings from overseas. Immediate support levels are 11000, 10948 (last week’s low) and 10826 (70-d SMA). Upside target remains at 11500-700 points. 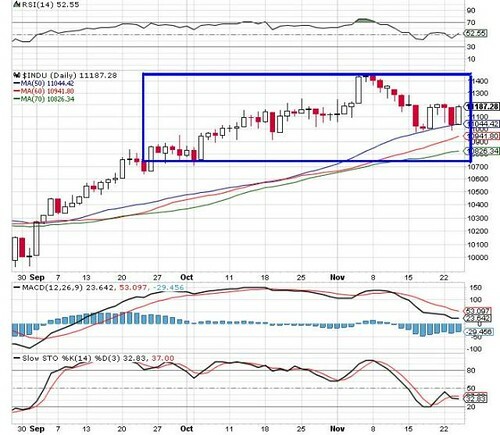 Daily Dow Jones is moving within the trading box.